This is content from the home.spogbiper.com website which ran on a CoCo during the 2010 RetroChallenge. One requirement of this challenge was that entrants maintained a blog detailing their efforts. We used the CoCo both to fulfill this requirement and to demonstrate our project. I continued to use this site as a blog for the DriveWire project after the contest was over, until May 2010 when the CoCo suffered a hardware failure. The CoCo had served over 30,000 requests when it finally gave up the ghost. Boisy, Jim and myself will all be at this year's CoCoFest, May 15 and 16 in Elgin, Il. We will be demonstrating new CoCo tricks and giving a presentation on DriveWire 4 and NitrOS-9. Hope to meet lots of CoCo people there. Also, I've set up a website with lots of documentation on various CoCo programming topics. I've optimized the PDFs to make them smaller and easier to read, and hopefully found the most current versions. You can find this at cococoding.aaronwolfe.com. Hope it is useful. Another beta released at the beta info site. This version adds support for multiple CoCos and a new XML based configuration that allows us to do some fun stuff. I've included disk sets that allow you to play any of the games from the NitrOS-9 CVS or boot the nightly build of NitrOS-9 directly off the NitrOS-9 web site. To see the catalog of disk sets available, type 'dw d se sh' at the OS-9 prompt. To load King's Quest 4 for example, you would then type 'dw d se l kingq4'. Press reset and the game will boot, no need to download the image. Another new feature is the "UI" port which will be how future user interfaces talk to the server. You can telnet to this port (default is 6800) and send any dw command directly to the server. This lets you change disks/disk sets or view status information even when you can't get to an OS-9 prompt on the CoCo. I've added several ready to use disk images to the DW4 project site. These have been around for a while, they come from the NitrOS-9 prject CVS. They are mostly OS-9 games that have been modified to use the DriveWire device to boot. I'm trying to collect DW enabled disk images for use in a public disk repository, so if anyone has more to contribute please let me know. An updated beta is available. This version adds more robust disk image handling and an initial version of a remote file manager for OS-9. Details and documentation can be found on our project wiki. New beta files on the project page. This update includes many improvements and some additional features including a virtual Epson FX-80 for creating retro style print outs. I've also included an "extras" disk image with httpd binaries and an early version of Wayne's IRC client. The authentication issue with the default settings has been corrected. Our group was the first 'official' exhibitor to sign up for this year's CoCoFest. We will be demonstrating all the new DriveWire features and may have some surprises to share as well. Boisy and Jim are definitely attending, and with any luck I will make it as well (if I do, it will be the first CoCoFest for me). We've started adding information to the DriveWire project wiki on SourceForge. There is much still to be documented, but if you're motivated you may find the guide to building from source and other info enough to compile your very own DriveWire 4 server from CVS. If you do, and have anything to add to our documentation that might help others, be sure to let me know. The DriveWire team took first place in this year's RetroChallenge Winter Warmup. It was inspiring and a lot of fun to participate. I'm looking forward to the summer event. Some of the RetroNet folks have started a new magazine (print only) about retro computing, '300 Baud'. I remember magazines being the only source of information for computer fans 'back in the day', so a print magazine seems like a perfect fit for retro fans. Check it out if you're a fellow enthusiast. It has been fun and motivating to be part of this year's RetroChallenge Winter Warm-up. I've enjoyed reading about what other retro computing fans are up to. As the 'contest' comes to an end, I thought I'd summarize what our project has done in the past month. First, we added internet capabilites to the Tandy Color Computer via extensions to DriveWire. One of the initial uses was the CoCo's first web server, which is serving you this web page and acted as our blog for updates throughout the RetroChallenge. Next we added the ability to telnet into a CoCo from the internet, and eventually also the ability to telnet out from the CoCo to internet BBSes and places like RetroNET. We created an 'inetd' for OS-9, allowing any program that reads/writes using std IO to be used as a server over the internet. This let us make a classic BBS (OS-9 L2 BBS) internet accessible for the first time. Finally, we created an easy to use API and libraries to help other folks develop new CoCo/internet software. The first project that makes use of our API is ccIRC, a CoCo native IRC client. Let's hope there are many more! Along the way we fought off a redneck 'hacker' (Shout out to Birmingham! ), found 25 year old bugs in the CoCo's operating system, and generally had a great time. Thanks to the RetroChallenge folks for putting on a fun event and great job to all the participants. Lot's of interesting stuff going on in the retro world! We're drawing near to a public release. Still kicking the tires and chasing down the odd bug here and there, but things are working really well. The optimizations done in recent days have brought noticeable improvements to performance, so I hope it's worth the wait. Last major tasks are finishing up the web interface and documenting everything. Hopefully Jim and I will find time to do this very soon. In other news, Boisy has the telnet client working better than ever and has packaged the routines needed for OS-9 programs to access the internet into a handy library. We're hoping folks find it easy to build on our work and create lots more internet capable CoCo software. Wayne's got his IRC client (called ccIRC) almost done. It works pretty well already, allows server selection, joining channels, customized messages and I'm sure a lot of other nice things. I've improved the way DriveWire deals with disk images in a number of ways. We use an in memory, sector by sector cache, which allows us to do lazy writing of changes to the disk, and we don't have to keep the file open. We now also do a periodic checksum on the disk file to detect and merge any changed sectors back into our cache. This allows you to manipulate the .dsk image while it is still mounted in the CoCo. You can use any .dsk tools on the server to add or edit files and see the changes show up live on the CoCo. Boisy has done a lot of great work improving the OS-9 side and sorting out some bugs, mostly my fault. Boisy made it much easier for applications that want to establish a TCP/IP connection to find a free channel for their communication. Until now, a process would have to try opening one after another, looking for one that isn't busy. Now there is a 'meta' device, /N (without a number specified) that will automagically attach to you a free channel. This makes using internet connections from OS-9 about as easy as printing. Nice! Also, I've added code to dynamically adjust the polling rate of our driver, from every 1/20th of a second up to once every 2/3rds of a second depending on traffic and type (interactive typing, bulk data, idle). This speeds up boot and helps DriveWire stay out of the way of other processes on the CoCo, improving performance everywhere. Here are some pictures of the newest addition to the University of Louisiana computer science lab. Boisy is there working on his thesis and (of course) using a CoCo as the platform of choice. His project is to measure the power consumption of the different instructions used in the CPU and then develop strategies for compilers to build 'green' executables (Forgive me if I've gotten this wrong!). The CoCo used is taking advantage of the new headless mode to gain both more usable memory and easy remote access to test software. We've added support to use one of the virtual channels as the main 'Term' device in OS-9. This means you can run a headless CoCo and leave the drivers normally required for the CoCo's graphic console out of your boot file. The resulting memory savings are significant. This should allow a 128k CoCo to run programs that it could never fit into memory with the traditional CoCo console drivers loaded. The boot file can now be so small that it triggers an ancient bug in OS-9 that only occurs with tiny boot files. Boisy's looking into that. Well, we don't have a public release ready yet. However, much progress has been made in a number of areas and some new features have been added. Boisy has telnetd almost complete, and it's working really well. The new 'on demand' dynamic forking of shells (or bbs instances, or ??) is more efficient than the old model and allows us to properly terminate connections when the remote side disconnects. Some new features have been added to the core server and Jim's web UI is coming together nicely as well. I've even started work on making it pretty, if thats any indication on how close we are to a release :) Hope to have something available this week. The disks for this great old BBS system were recently found and posted to the CoCo mailing list. I managed to get a system up and accessible via telnet at the spogbiper address. Several people logged in for a taste of the retro action. In the future I hope to run a BBS full time on the CoCo, but for now the test is over while my CoCo is used to test the pending DriveWire release. This website may also be unavailable more than usual for the next few days. We are planning to finish up current features this weekend and have a binary download ready next Monday. This download will contain a JAR file with the DriveWire server and all required Java libraries, a configuration file, a native library file for your specific platform, and a batch or script file that starts everything up. We hope to have 'double click and run' ease of use on Windows, OS X, and Linux (32 and 64 bit of each) and also support for the Linksys NSLU2. Over 35 platforms are supported by the serial libraries we use, so chances are even if you're not running one of our main targets, you can still run Java DriveWire with a little work. 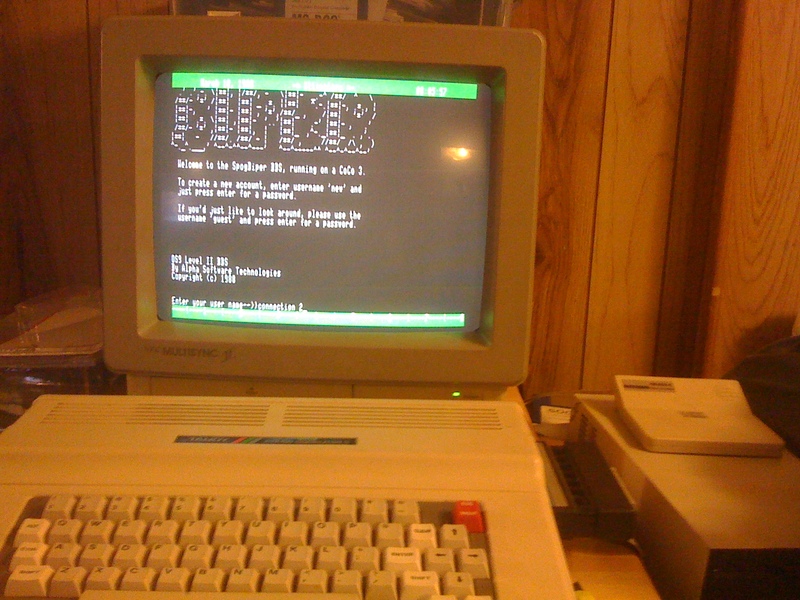 Boisy added some telnet protocol processing that allows the CoCo telnet client to work well enough to connect to retro-net.org and log in to my local linux box. I also connected from my coco to Boisy's coco, the first coco to coco login over the internet. Wayne's got the IRC client connecting to IRC servers and able to chat and send basic commands. Boisy and I have worked on a CoCo native telnet client as well. Telnet is a suprisingly complicated protocol, but we're making progress. Jim Hathaway has merged his new web interface for the Java DriveWire server with the server back end. He has also created an Ant configuration that makes building a runnable jar from the source very simple. The code is available on SourceForge CVS, in the Java_Server directory. Mr. Wayne Campbell is writing the first '3rd party' application that makes use of the new TCP API in DriveWire. His IRC client will allow users to chat in multiple channels in an OS-9 native interface. Wayne is also working on a project that converts packed Basic09 I-Code back into source code. This will hopefully let us use RiBBS as a multi line telnet BBS soon. We've entered this project in the RetroChallenge Winter Warm-up 2010. Welcome to all the new visitors. We'll see if the CoCo can hold together :) If you are working on a CoCo or other retro computing project, consider entering the challenge.